Exercise 7, Cloudy weather and rain. For this image I have decided to use panning on people passing by with their umbrellas to create movement in the direction of the rain as rain can be hard to show. I wanted to avoid droplets as I could not think of an unusual way to photograph this.I used a slow shutter speed which I do like to play around with but it can be very hit and miss at times. 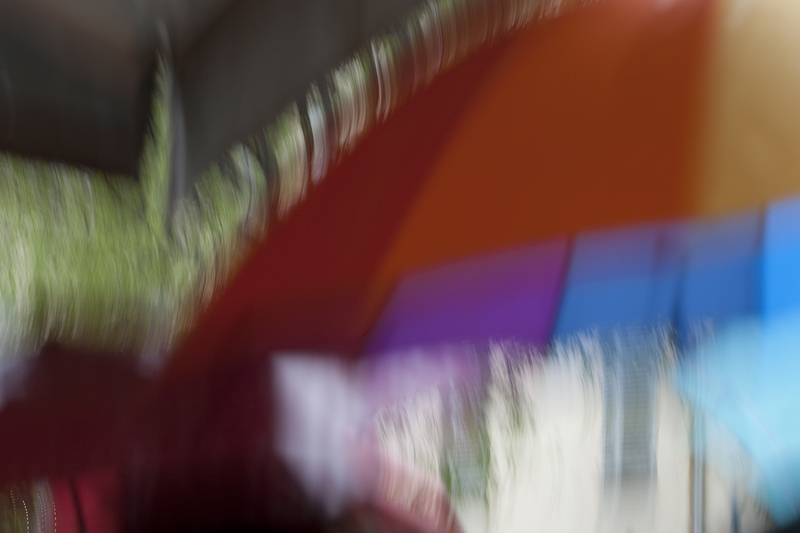 A passerby holding the stereotypical large multi-coloured umbrella even slightly unclear in the image you can tell what it is and the effect of movement gives the impression that the rain is running the colours of the umbrella. Part (a) The aim is two show the difference in the same scenes shot in direct sunlight and with cloud coverage. Firstly I have taken some of the same shots when the sun is shining and when the sun is covered with cloud. Each situation is different there are times when the sun works and times when cloud is better. What I have noted is that in the shade we can see more texture for example in the spray painted wall and I like this texture. On the second wall where there is writing to say it is a bread shop in the sun we cannot read the writing and the image is flat. In the shade so with the diffuse light we can read what is painted on the wall well with the correct exposure giving also the detail of the wall. The next scenario is a bit different it is a street scene however the sun is falling through the trees. With cloud cover the shot is drab with no life and a dull colour. With the sun direct through the trees not only does this create a pattern on the ground it also give more life to the colour of the wall. The final image of the front of a cafe. With the direct sun there are shadows which create lines from each of the light fittings outside. The shadows are interesting and add to the image however the direct sun takes away from the green colour of the windows. ← Exercise 3, Colour Relationships. Working towards assignment 3.